The linear referencing system (LRS) is a collection of feature classes and tables that allow the storage and editing of calibrated routes. The LRS supports the use of a single polyline feature class, known as centerlines, to store the geometry for multiple routes. Centerline geometry, along with route definitions, is stored in a network feature class. A many-to-many relationship exists between the routes in the network and centerlines providing the geometry. This means that routes are typically composed of multiple centerline features, and centerline features can participate in multiple routes in multiple networks. In addition to geometry, routes must also have measures. Measures on routes are what the LRS uses to display event layers in their correct locations on a map. Measures are added to routes through a process known as calibration. To explicitly control how routes are calibrated, the LRS uses a calibration point feature class. Calibration points are point features that store measure values, route references, and network IDs. The combination of these three items constitutes a linear referencing method (LRM). 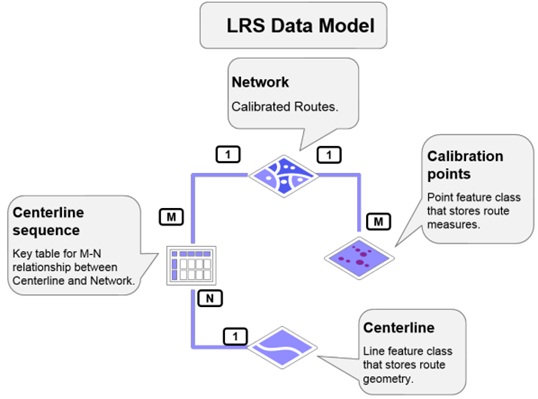 LRMs are created by applying calibration points to routes to create an LRS Network. Centerline—The polyline feature class that stores route geometry. Centerline Sequence—The cross-reference table that manages the relationship between centerlines and routes. Calibration Point—The point feature class that stores route measure values. Redline—The polyline feature class that stores markup features for communicating LRS changes. These feature classes and tables, with all necessary fields, can be generated automatically using the LRS setup wizard. The centerline feature class provides a single source of geometry for all of the LRS Networks you build in an LRS. Every feature in the centerline feature class represents a single unit of the highway. These can be used to represent a one-to-one relationship with routes or be combined to form larger routes. The tolerance and resolution settings of the centerline feature class are propagated to the networks, intersections, and event feature classes registered with Esri Roads and Highways. The spatial reference, x,y-tolerance and resolution, and z-tolerance and resolution of the centerline feature class should match that of the source routes that will be used to load data into your LRS. The centerline feature class must be z-enabled and cannot be m-enabled. The LRS requires that the centerline feature class have a centerline ID field. The CenterlineID field is a system-maintained field that is auto-populated by ArcGIS referencing tools. This field should not be edited manually. The many-to-many relationship between routes and centerlines is maintained through a cross-reference table known as the centerline sequence table. Since route IDs are not unique in the LRS, the centerline sequence table also contains a reference to the network ID field of the LRS Network. The combination of the network ID and route ID creates a way of uniquely identifying each route in the LRS. The use of the network ID helps differentiate between LRMs as route IDs may not be unique across networks. One centerline feature can participate in many routes, and a route can be comprised of more than one centerline. The centerline sequence table must have at least one record for each centerline-network combination. The unique ID for the centerline geometry. The date that the portion of the centerline becomes active. The date that the portion of the centerline will be retired. The unique ID for the route. The unique ID for the LRS network in which each route participates. Records in the centerline sequence table should not be edited manually. The NetworkID field will be registered with the dLRSNetworks coded value domain when the LRS is created. There is only one calibration point feature class for all LRS Networks registered with the LRS. A minimum of two calibration points is required for each route. Calibration points should be monotonic, meaning strictly increasing or decreasing in measure along a route. Non-monotonic routes will calibrate, but could result in undefined event locations and event behavior. Add a calibration point to a particular location to maintain a specific measure value. The calibration point feature class should have the same spatial reference, x,y- and z-tolerance, and resolution as the centerline feature class. The calibration point feature class must be z-enabled and cannot be m-enabled. The measure value stored for routes in an LRS Network. The date that the calibration point becomes active. The date that the calibration point will be retired. The unique ID for the LRS Network. Geoprocessing tools are provided to help generate calibration points, update calibration points, and detect non-monotonic calibration on your routes. See Generate Calibration Points, Update Calibration Points, and Detect Non-Monotonic Routes. The redline feature class contains the basic information required to perform many of the route editing functions available in Esri Roads and Highways. The redline feature can be thought of as a placeholder for a future route editing operation. It is used as a markup feature so that LRS users don't have to be LRS maintainers. It can be disruptive to a user's workflow to discover differences between the LRS and the real world. Instead of stopping work and waiting for the LRS to be updated, users can enter a redline feature into the geodatabase to indicate where the route should be, notify the GIS team, and continue working with the event data. The redline feature class should have the same spatial reference and x,y-tolerance and resolution as the centerline feature class. The redline feature class must be z-enabled and cannot be m-enabled. The starting measure of the alignment change. The ending measure of the alignment change. The unique ID for the target route. The name for the route. The date that the route change becomes effective. The date will be applied to events affected by the change. The edit activity that should be made, such as Extend Route. The unique ID of the LRS Network. The NetworkId field will be registered with the dLRSNetworks coded value domain, and the ActivityType field will be registered with the dActivityType coded value domain when the LRS is created. Redline features can be entered as accurately or as generally as you like. It is expected that a GIS analyst will verify the redline feature and ensure that accurate geometry is entered into the database. A roughly sketched redline indicates that a change to the LRS is required and provides a general location. The network feature class contains the route features used in the LRS. These routes have attributes, geometry from the centerline feature class, and calibration from the calibration point feature class. Combined, these elements constitute a route in the LRM that can be used to locate events on that route. Each route should have a unique route identifier, called a route ID. The route ID can be a single field or a concatenation of multiple fields. If the network will use a concatenated route ID, all of the fields that comprise the route ID should be present in the network feature class, in addition to the RouteId field. The route ID field data should be consistent throughout networks, events, calibration point feature classes, and the centerline sequence feature table. If the network feature class is modeled before the LRS is created, ensure that the x,y- and z-tolerances and resolutions match those of the centerline feature class. The m-tolerance and resolution for the network will be based on the units of measure of the spatial reference for the network feature class and the units of measure for the LRM being used. If the units of measure are the same, the m-tolerance and resolution will be the same as the x,y-tolerance and resolution. If the units of measure are different, you need to convert the x,y-tolerance and resolution to the corresponding m-tolerance and resolution. For example, suppose your network feature class has a spatial reference in meters, with an x,y-tolerance of 0.001 meters and x,y resolution of 0.0001 meters. If the units of measure for the LRM are in meters, then the m-tolerance would be 0.001 and the m-resolution would be 0.0001. However, if the units of measure for the LRM are in kilometers, then the x,y-tolerance and resolution values would need to be converted from meters to kilometers for the m-tolerance and resolution. In this example, the m-tolerance would be 0.000001 and the resolution would be 0.0000001. The network feature class fields should not be directly edited. They're maintained by Location Referencing. Fields that comprise the routeID field. The fields that comprise the concatenated route ID for the network. Each field should be modeled separately in the network feature class. For information on the event data model, see Events data model. For information on the intersection data model, see Creating an LRS intersection class.